The Antonov An-124 is a Ruslan strategic airlift jet aircraft. It was designed in the 1980s by the Antonov design bureau in the Soviet Union (USSR). The An-124 was for thirty years (i.e., until 2011) the world's heaviest gross weight production cargo airplane and second heaviest operating cargo aircraft, behind the one-off Antonov An-225 (a greatly enlarged design based on the An-124).The An-124 remains the largest military transport aircraft in the world. The commercial version of the Antonov AN-124 has the designation 100M, of which about 26 remain operational. 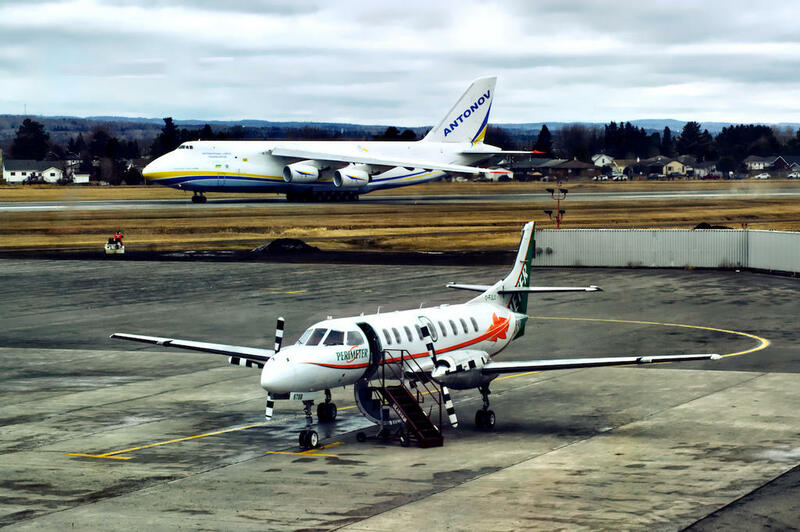 An Antonov AN-124 100M visited our airport in Thunder Bay three times this past year to deliver railway car materials from Austria to the Bombarier railcar factory. The local paper reported the cost per journey approximated $1million. The Bombarier factory had historical importance for the aircraft industry because a previous owner (the Canadian Car and Foundry Company) manufactured Hawker Hurricance fighter planes there during WW2. More than half the workforce were women directed by chief engineer Elsie McGill. The latter, known as "Queen of the Hurricanes", was likely the world's first woman to earn an aeronautical engineering degree and the first woman in Canada to receive a bachelor's degree in electrical engineering. Along with some other interested folk, I went to the airport last Thursday to watch the Antonov take off for its return to Europe. 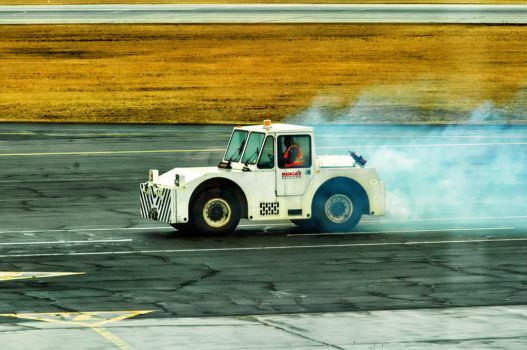 The first photo shows a truck pushing the plane from its parking place to the runway. The people seem the size of ants when walking alongside the plane. The sturdy truck did its job of pushing well, but the effort clearly exhaused it (pun intended). With the job done, clouds of smoke emerged as the poor vehicle struggled to make its way back to the mechanic's shop for repairs. I hope it recovered. Should I have sent flowers? The Antonov taxied to the start of the runway and revved its engines. Look at the dust cloud behing the plane's tail. 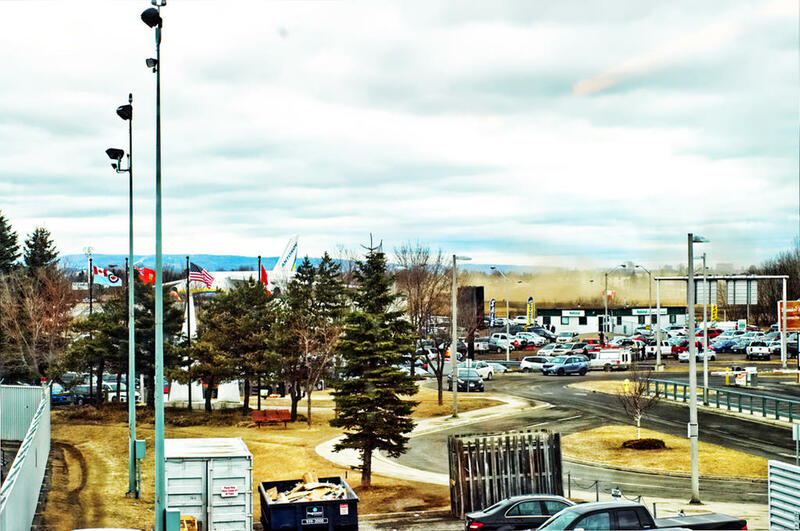 The cars in the parking lot would need to visit the carwash later that day. Who'd pay for that? Then take-off! I was amazed how quickly the plane accelerated down the runway. Apparently, the plane needs 1.5 miles of runway when fully loaded, but it was empty this time. That must have been fun to see . It can;t be often one spots these exceptional vehicles in operation. I was thinking, does Anatonov make telephoto lenses too, LOL! Did they announce on local TV or you heard it by word of mouth? I now will look to see how it compares to our large cargo planes. Read about it on a local news site. Had a bit of luck, however, by going to see the plane around midday even though the news site gave an evening take-off time. The take-off occurred at 1.00pm, so my timing was perfect. Only the biggest Boeing 747 8 planes are heavier. These are enlarged versions of the 747.. The cargo version is the 8F that went into commercial operation in 2011. Hmmm don't forget the Airbus A380 ! Wrong category, Nicholas. The Airbus A380 is a passenger plane. The Airbus cargo plane is the A300-600ST, known as the Beluga. The Beluga can carry just under 104,000 lbs. The Boeing 747-8 comes in variants that include cargo planes (the 8F) and passenger planes (the 8I). The HF cargo version can carry 308,000 lbs. The Antonov can carry 508,000 lbs of cargo, according to Wikipedia. Oups! my bad! thanks for the clarification Michael! You don’t need a plane, Nicholas. Your wonderful photos of boats more than reach the sky. Ha Ha! They are flying high! Mike, cool shots of the plane. Did you get any shots of it flying ? Our Boeing Dreamlifter is comparable. There are four of them. 285,000 lb. Lockheed C-5 Galaxy military plane, can be refueled in air unlike Antonov An-124. 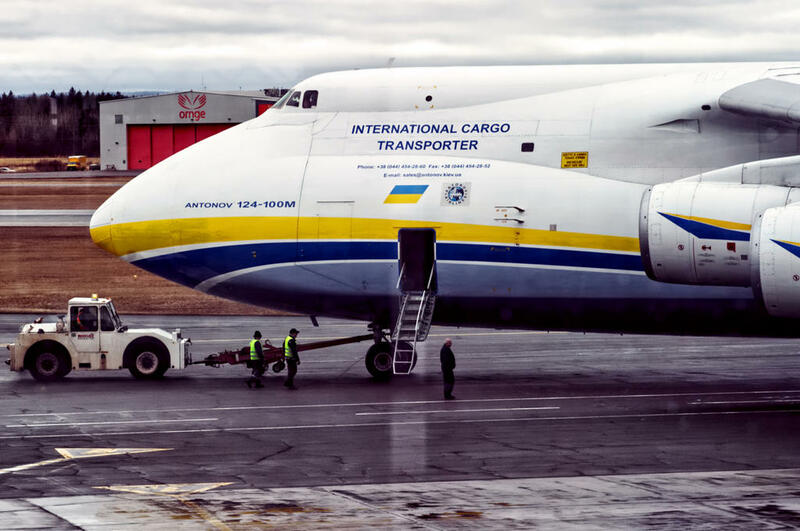 Boeing 787 parts were deemed too large for standard marine shipping containers as well as the Boeing 747-400F, Antonov An-124 and Antonov An-225. Initially, three used passenger 747-400 aircraft were to be converted into an outsize configuration in order to ferry sub-assemblies from Japan and Italy to North Charleston, South Carolina, and then to Washington state for final assembly, but a fourth was subsequently added to the program.